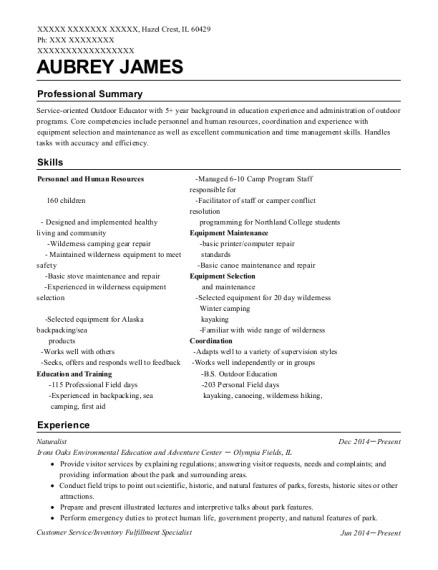 Responsible employee, proficient in Customer Service and promoting the YMCA. Passionate and motivated, with a drive for excellence. Several years working with the YMCA in Alabama and New York. Prepare and present lessons and activities about Outdoor Enviormental Education. Conduct field trips with schools with kids ranging from 4th to 8th grade. Perform routine maintenance at Camp. Ran all of the athletic progressive programs at Talcott Village (12-15 year olds). Created lesson plans for all counselors so they can effectivley lead progressive athletic programs. Assistant Program Director for all programs including Arts and Crafts, Outdoor Life Skills, Media, and Night and Weekend programs. Prepare, maintain, or oversee the prennel reports and records.paration and maintenance of attendance, and activity, planning. Prepared and presented lessons and activities about Outdoor Education. Assisted with the set up and activies for weekend retreats. In charge of Counselors In Training (16 years old) and Leaders In Training (15 years old). Led workshops with the CIT's to teach them how to become a successful counselor in the future. Taught LIT's the importance of leadership and how to become responsible for someone other than themselves. 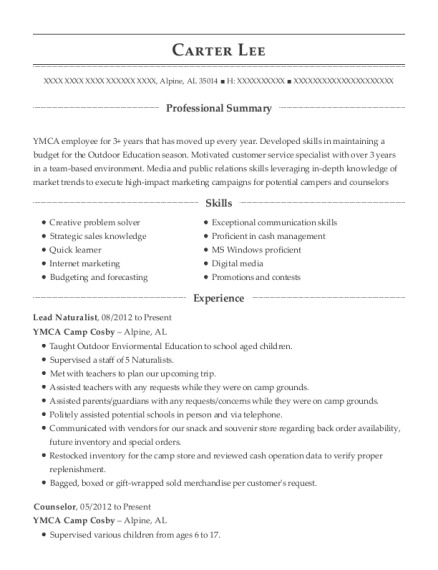 This is a resume for a Naturalist in Birmingam, Alabama with experience working for such companies as YMCA Camp Cosby and New York YMCA Camp. 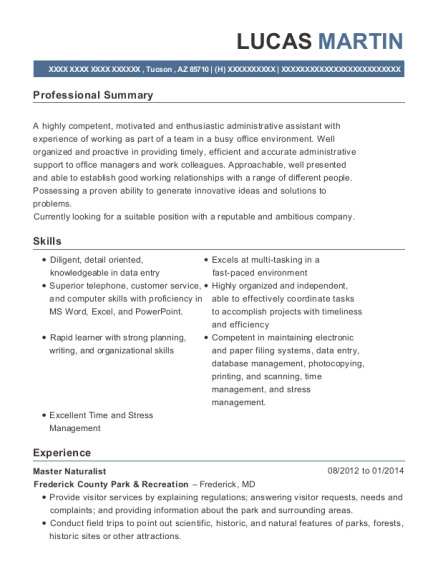 The grade for this resume is 0 and is one of hundreds of Naturalist resumes available on our site for free. 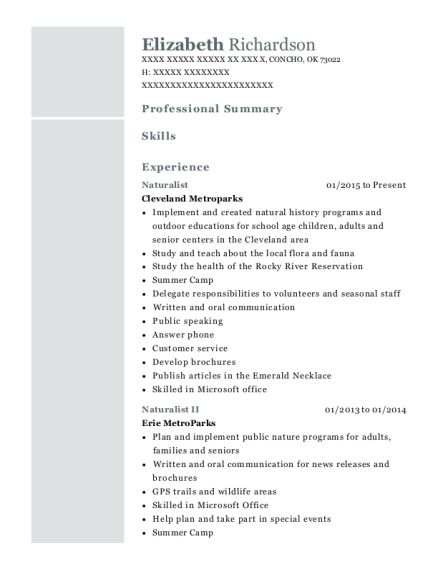 Use these resumes as templates to get help creating the best Naturalist resume.